Tom Lorraine says AFC Rushden & Diamonds are setting their sights on a play-off place in the Evo-Stik League South Premier Division Central. Diamonds’ first-ever season at Step 3 couldn’t have gone much better as they currently sit in third place following a superb 4-1 victory at Leiston last weekend. While most expected Andy Peaks’ team to focus on consolidating their position following their promotion last season, Diamonds have instead taken the division by storm as they approach the halfway point of the campaign. They are nine points off the top two – Kettering Town and Stourbridge – but there isn’t a great deal to separate the rest. 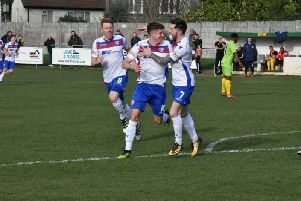 And Lorraine, who scored his 81st goal for the club in last Saturday’s victory, insists a top-five finish is something he and his team-mates are now looking for. “I know it’s a cliche that people don’t want to hear but taking each game as it comes is working for us,” he said. “We look at the next game and try to get the right result and that’s the same theme each week. “We know there are teams below us with games in hand but we are happy to have the points on the board. “As players, are we looking at the play-offs? Yes, I think we are. Kettering and Stourbridge have opened up a bit of a gap at the top for the time being so it’s a bit of a competition for the rest at the moment. “The play-offs were something we looked at from the start of the season and now we are in a decent position at the start of December so we have given ourselves a chance. “There’s no pressure on us to go and get in the play-offs and win them. Diamonds are back on the road this weekend when they travel to Alvechurch.